Motto: Patience is victorious in hardship. 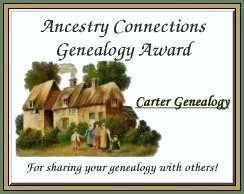 Welcome to the Carter genealogy web site that includes a number of related surnames. We hope you are able to see where you fit into this family and maybe learn something interesting from it or contribute to it. If you have information to add or update then please submit your information here for each person at a time. Thanks! Family Tree: to view this data in a tree format you must have the free GenoPro software installed on your computer. Then click here to view the family tree. When viewing the tree in GenoPro the links to individuals won't work, so you have to view them on this web site. Thanks. Coat of Arms: Origin displayed is English. First found in Winchester, where the carter family was seated from ancient times. 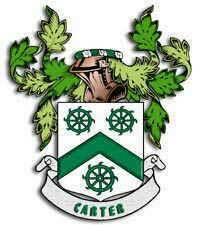 Some of the first settlers of this name or some of its variants were: Ambrose Carter, who settled in Virginia in 1663, Thomas Carter and his wife Frances, who came to Philadelphia in 1685 with their children Thomas, Henry, Ann, and John, Chris Carter, who immigrated to St. Currently we don't have a link to these older lines. Click here to see a British "Maker/driver of carts" origin Coat of Arms I am researching that is blue with two gold combatant lions. The crest is a black dog rampant. And the motto is Victrix patientia Duris which is "In difficulty, win by patience." To view the family tree familytree.gno, you must have GenoPro installed on your computer.